However, Burger King can now say, “Number one tastes like piss, number two tastes like poop, and number three tastes like paradise.” Although, if humans evolve and we end up producing a third human waste, Burger King might want to drop down to number four. What caused Burger King to lose their place as the distant runner-up to McDonald’s in the burger world? I’m no business analyst, but it might’ve been their advertising, which included the cold plastic eyes of The King. Or it could’ve been their chicken fries. To turn their fortunes around and become a distant second to McDonald’s again, Burger King has introduced a number of McDonald’s-like products, such as their new fruit smoothies. These smoothies are made using real fruit, low-fat yogurt, and ice, and come in two flavors, Strawberry Banana and Tropical Mango. I didn’t get a chance to see how the smoothies were made, but I assume it’s the same process McDonald’s uses, which involves shooting ice and a smoothie mix that consists mostly of fruit puree into a blender, and then letting the blender’s blades do their magic. If you’re curious to know what those smoothie mixes are made out of, continue reading this paragraph. If not, I would suggest skipping it, and continue reading after the “BOOYAH!” The strawberry banana smoothie mix is made up of banana puree, strawberry puree, sugar syrup, strawberry puree concentrate, water, concentrated grape juice, natural flavors, concentrated carrot juice, xanthan gum, pectin, guar gum, and CMC gum. The tropical mango smoothie mix consists of water, sugar syrup, concentrated grape juice, apple puree concentrate, concentrated pear juice, mango puree concentrate, concentrated pineapple juice, concentrated orange juice, concentrated apple juice, concentrated passion fruit juice, natural & artificial flavors, xanthan gum, pectin, guar gum, cellulose gum, beta carotene, and citric acid. In order to help me prepare for when I have multiple children, I will pick a favorite between the two Burger King Smoothie flavors and then shower it with love and praise. If you don’t have the bladder capacity to consume both smoothies in one sitting, I’d suggest purchasing the Tropical Mango flavor first, because it’s by far my favorite of the two. Although it contains enough fruit varieties to qualify as a fruit stand (see paragraph before “BOOYAH!”), I mainly taste mango and orange. The mango, surprisingly, tastes fresh, while the orange tastes orangy. The Burger King Tropical Mango smoothie is quite tasty and a little toothachingly sweet, but I do think the McDonald’s Mango Pineapple Smoothie is slightly better and more tropical tasting. As for the Burger King Strawberry Banana smoothie, the banana and strawberry flavors are equally balanced and I think it’s pleasant tasting, but it doesn’t make me yearn for another like the tropical mango does. Let me put it this way, the BK Tropical Mango Smoothie is fun, like chasing a rainbow after taking a few bong hits, while the BK Strawberry Banana Smoothie is adequate, like a Cup Noodles is for lunch. To be honest, it’s nice to see a few more healthy-ish item in the sea of burgers and fried food otherwise known as the Burger King menu board. But will smoothies help Burger King retake second place in the fast food burger world? Pros: Cool. Tropical Mango is tasty. Made with low-fat yogurt and real fruit (puree and juice). Doesn’t have 1,000 milligrams of sodium like Burger King’s other new menu items. Chasing rainbows after smoking weed. Cons: Strawberry Banana is adequate. Tropical Mango is toothachingly sweet. Tropical Mango isn’t as good as McDonald’s counterpart. Bladders that can’t handle drinking two smoothies in a row. Picking a favorite child. The lifeless eyes of The King. I tried Burger King smoothie yesterday. It was ok. Prefer McDonald’s. Burger King wasn’t blended well and still had chunks of ice in it. My experience with BK’s strawberry-banana smoothie has been quite different from you two. The first time I tried it I was very pleasantly surprised at how good it is. It was blended perfectly, very very smooth. It also has a very distinct and fresh flavor or strawberry AND banana. No chunks of ice at all. This may have to do with the varying quality of individual restaurants and whether or not the employees are taking care to make it correctly. I make my own smoothies at home and I always try to use fresh fruit if it’s on season. If it’s not, then frozen fruit is quite excellent these days. Modern freezing process’s have come a long way, and frozen fruit can be quite delicious when using them in smoothies. Coming from experience in making my own smoothies, I think BK has done a great job with this smoothie. I have yet to try the mango, but I will soon. I don’t frequent fast food places that often, but I will say that ever since I tried BK’s smoothie, I have gone back a number of times just to get one, they’re that good. I have also tried the McD’s strawberry banana and wild berry. In fact, I have a McD’s strawberry banana smoothie right now as I type this. It too is good, but in comparison BK’s S-B smoothie is BETTER. Why? BK’s smoothie has a great balance of strawberry to banana flavor where both fruits share the stage on the palate. McD’s smoothie has a milder banana flavor, and the strawberry has a hint of “strawberry” flavor that seems to be added to boost the berry flavor. There are LOT more McD’s in every area compared to the limited number of BK’s restaurants. I think that’s a major reason as to why McD’s is more popular, plus the fact that McD’s targets the childrens market much more and better than BK. BK’s burgers are superior to any burger McD’s offers. The flame broiling adds a more mature flavor to their burgers than McD’s burgers, which tend to appeal to children’s more sensitive palates. BK is for grown ups and McD’s is more for kids. Back to the smoothies. So far I’d say my purchase ratio between BK and McD’s smoothies is 4 to 1 in favor of BK. Oh, and another reason why BK lost it’s market share, imo, is due to their fries, the way they USED to make them before the new fries they use. The fries at BK before were simply awful. They tasted more like potato chip fries than actual potato fries. That made a HUGE impact on BK’s dropping sales. People want burgers AND fries, and if half of that combo isn’t so good, then they whole thing loses market share. BK’s new fries are excellent, much better than before. They are now a cross between Wendy’s fries and McD’s fries. Wendy’s smoothies? Too watery and too much ice chunks. I tried the new crispy chicken wrap and it was just a small chicken strip with tons of lettuce. The chicken wrap was ok but nothing special. I tried the tropical mango smoothie and it taste like water and chunks of ice. I prefer McDonald’s smoothie. Burger King is only holding on by a hair. The only thing they have is the whopper. About to sample BK’s mango smoothie in combo w/ chicken strips & fries….fingers crossed I won’t be disappointed! Thank u for your input!! I tried both smoothie and loved it o_O I would have to say it depends on peoples’ taste bud. For example, I love sweet smoothies and my sisters love not so sweet ones but the one at BK we all enjoyed and would buy it again. So I believe it’s based on personal preferences. If you don’t enjoy it, it doesn’t mean that everyone won’t enjoy it either. I started with the McDonald’s smoothies, got addicted, and, on a whim, tried the Burger King ones. Now, I will only get the McD’s one if I want the darker berry flavor. I have yet to find any evidence of ice chunks in the BK smoothie, and they are cold and produce ice cream headaches if drunk to fast. McD’s *always* has ice chunks, is more fruit slushie than smoothie, and does get watered down quickly. I had a smoothie from Panera today, and was disappointed that it wasn’t as good as BK’s (and more expensive)! I just had the BK Mango Smoothie and loved it. I didn’t think it was too sweet or too sour…it did taste a lot like unsweetened orange juice but it was slushy and cool and its hot outside. It was perfect and I drank the WHOLE THING! 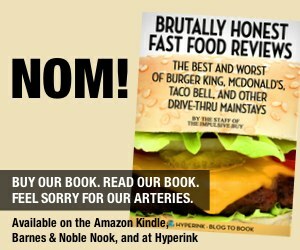 I believe BK’s smoothies are excellent – best in the fast-food segment, and far superior than McDonalds as they taste like the real thing and are not as sweet (as Mac’s) as they may be absent of artificial sweetners like high-fructose corn syrup. That’s really surprising. The consistency between stores much be extreme. I’ve so many BK smoothies now that I can’t count, and have never had a single one that tasted, “lie nothing but water….”. That comment doesn’t even register with me as I can’t see how it could taste like that at all unless your BK restaurant didn’t put any fruit mix in, which could be. The smoothies between BK and McD’s are very similar, just slight difference in flavor balance, and BK’s has a better “mouth feel” as it feels a bit thicker, richer. It’s not night and day as your bad experience shows. As I said, consistency isn’t great with these fast food restaurants. Once in a while I have a craving for a quarter pounder. Problem is that the McD’s in my area doesn’t understand the meaning of “fresh”, and the burger is always dry, the cheese had that ‘sitting too long’ crust on it, and the bun is NEVER fresh. The other night I actually went into the restaurant and asked for a quarter pounder and told them that I wanted a FRESH burger and that I don’t mind waiting. BIG difference. The burger was juicy and flavorful. That’s what a real freshly made quarter pounder should ALWAYS taste like. Oh, again, the bun was ok but not fresh and soft as it should be. Luckily the burger patty was so good that I let the bun slide. Try a different BK and try the S-B smoothie again. When you get one made correctly you’ll be surprised how good it really is. Never tried the smoothies but used to eat breakfast there 3-4 times a week. For some reason, they quit putting sugar out in packets. You have to ask for it, and they give you a small amount in a bottom of a paper cup. Cost saving maybe, but the cup must cost more than the sugar they give you. I only go to BK maybe twice a month now, when I have some leftover sugar packets in my car console from other fast food places. I hope they saved a lot of money by doing this. I have tried Burger King’s smoothies, and McDonald’s smoothies. they are mediocre. I own a coffee shop and I sell Dr. Smoothie smoothies, 100% crushed, no sugar added, and I can add yogurt with protein and fiber, that only adds 25 calories. Total calorie count on a 16 oz smoothie is 225. And now I will be offering fruit and veggie xmoothies, no sugar added. Best tasting fruit pureed smoothie out there!! the raspberry smoothie at bk is wonderful. For me, a vegetarian, I’m so glad they added smoothies to fast food menus. I’m ordering those instead of the junk, not in addition to. So there is no yogurt listed in your ingrediants! Is it a powdered substance in thier “mango mix”? I’m sorry we do not have any relationship with Burger King. I’m upset that it has yogurt in it because I am vegan. Apparently it is better for a vegan to prepare their meals at home before heading out for the day.